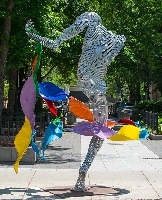 In 2005 Howard-Potter made his largest and most daring sculpture to date, The Muse. Standing 27 feet tall the monumental figure of a female form taking to the sky, made out of almost two thousand pounds of steel covered in a galvanized and powder coated silver skin took 4 months to complete and representing a major success in Mr. Howard-Potter's career. Howard-Potter resides in New York City with his wife, Erica, daughter, Skylar and son, Lyndon. He is a member of the Young Executive Board of the Elisa Monte Dance Company where he sketches rehearsals and draws inspiration from the dancers. He is an active athlete and cyclist competing in multiple races each year. I try to capture movement in a medium that does not move. Using steel which is an inherently rigid material I work to convey a sense of fluid action in space. My work explores the wide range of movement of the human figure informed through my study of drawing the human anatomy. My sculptures seek to convey the motion of the body in extremely stressful and beautiful positions; the moment that a dancer is at the peak of a jump, the weightless split second before a body succumbs to gravity. I am describing an ephemeral action in steel to convey this moment for eternity. I want the viewer to visualize the actions that led up to a given pose and the actions that will follow it. Using the brightly colored surfaces separates the figures from the landscape, making them stand out in much the same way people do when they wear clothes. The brilliant colors serve as protection for the steel from the corrosive outdoor environment as well as adding excitement to the steel to aid in the sense of movement. 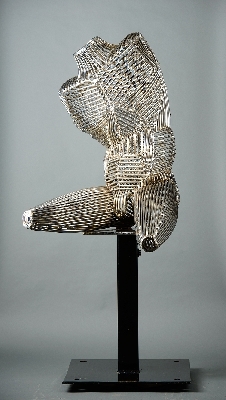 The work explores the range of possibilities and flexibility of the material as well as the subject matter. The display of my work in the outdoor public arena is the perfect place for the inherent academic roots to be brought to every person in an easily recognizable and accessible way, bridging the gap between the intimidating gallery or fine art institution and the general public.